No new art to post this week, but I did want to check in, and update everyone on what's been going on these last few days. 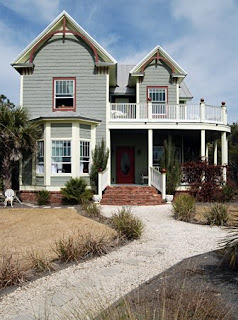 Karen has had her eye on this particular beach house for sometime now as a source of new images for her paintings. She decided that the winter rates were such that it was feasible to rent it for a few days, head down, and do a lot of photography. Anna's Veranda is a classic Victorian home moved to this location in the early 2000's, and it's really beautiful. The house completely lived up to the image promoted on its' website. We were lucky, in that the weather, and water, could not have been better. Plus, being there in February, we had virtually the entire beach to ourselves. I was there basically as Karen's assistant/tech support, but did manage to get a few shots in of my own. This was definitely a working vacation, and as exhausted as we both were when we left, we did have a great time. The image below is the sunset the night before we returned to Atlanta. Now we're back. Karen is filtering through the hundreds of images from Florida, and I'm getting started on the Chicago commission. This evening Karen and I are heading into town with Jeff and Leslie Cohen to attend the opening night reception of the David Arms show at Anne Irwin Fine Art. He will have a large number of paintings there, and I'm really looking forward to it. That's about it. 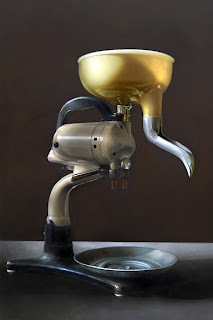 Stricoff Fine Art, Ltd. is anxious to have the Hamilton Beach Mixer (below), so I'll be shipping it off early next week. Now it's time to buckle down, and really get busy on the commission. Hopefully, I'll have an image of the first painting up some time later next week. If not the completed piece, at least an in progress shot. I began this painting way back when, but got caught up with the Print Pack commission. It felt good to get back to it once more. I love this old Hamilton Beach mixer. The juicer attachment looked so wicked with that long toothlike appendage, that I couldn't resist painting it in that configuration. I know it's an odd composition, and may have limited appeal, but it was a treat to paint. When I started this piece my intent was to offer it to Stricoff Fine Art Ltd., so I'll be emailing them this image for their approval. If they like it, it's theirs. Now that the mixer is done, it's time to get started on the commission for Chicago. There is an absolute deadline on this job, so there's no time to waste. As always, I feel as though I've bitten off more than I can chew, but I'm really happy with my photo references, and am looking forward to getting the project underway. Depending upon how things go, I may decide to post some "in progress" images of the painting process. Jeff Hayes has chosen me as the first interviewee for a new monthly feature on his blog State of the Art. He plans to spotlight a different artist each month, and I have to admit it was kind of fun. I first became aware of Jeff when I purchased a small painting of his a few years ago from ebay. We've been corresponding ever since. He, along with Belinda Del Pesco, were instrumental in helping me get my own blog off the ground. Jeff was also our trusted guide through the streets of Boston, when Karen, and I were there for our show at Wynne/Falconer in late 2007. 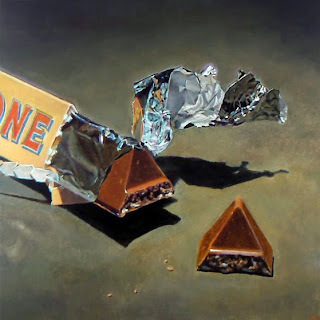 He's a terrific realist painter, Chocolate and Foil (above) is one of his paintings currently available for sale on ebay. I'm honored that he considered me, interview worthy. If you'd like to read the interview, and view more of Jeff's work, you can visit his blog by clicking here. I've ignored my own blog here lately. I've been busy working on compositions to submit to the company in Chicago for a possible commission. I received word a few days ago that they like what they saw. The images have all been approved, and a deposit check has also been sent. Good news. Now all I have to do is paint them. Which, for anyone who follows this blog, knows for me that means - freak out time. 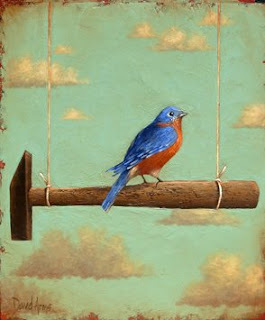 Since my last post I have managed to work on a new painting for Stricoff Fine Art, Ltd. in New York. It's a piece I began months ago, and never finished. The Print Pack Inc. commission was dominating all my time. It's nearly done, and should be ready to ship within the next few weeks. I'll post an image of it as soon as it is complete. The lack of time I've been able to spend workng for the galleries has been very distressing for me, but it's difficult, especially now, to reject work that pays immediately. Hopefully, I can finish this new commission quickly, and get back to work for the galleries very soon. One of the personal joys of my blog, is having a platform to brag on my friends, and colleagues. I've mentioned Jeff Cohen (see previous post) a number of times. Tonight I'd like to spotlight his wife Leslie. 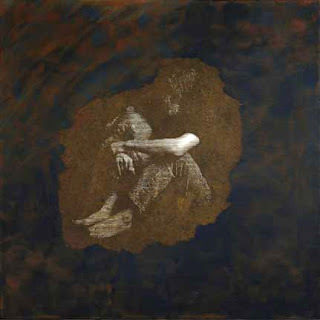 She was a graphic designer for years before she moved into the fineart realm with her etchings. They are not true etchings per se, but are reminiscent of that genre, and they're absolutely gorgeous. You have to see them in person to fully appreciate the delicate and complex technique involved in creating these. To see more you can visit her website. 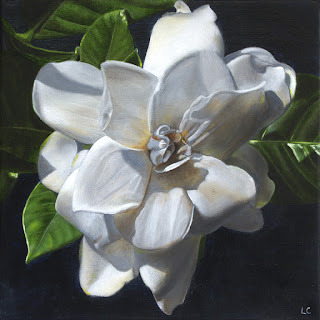 Then, all of the sudden, and seemingly out of the blue, she has become a photo realist painter. One day she wasn't, and the next day she was. It took me a lifetime to get where I am, and for Leslie it took, like a week. The amazing thing is she is so good. Right out of the gate. Karen and I had to call her when we first saw these new paintings, to ask, "who are you?". It's really exciting. We can't wait to see what will come next. These new paintings are being auctioned on ebay. If you'd like to take part in the bidding you can access the auction by clicking here. I wasn't able to get this painting completed by the end of the day last friday, so I held off posting it until tonight. 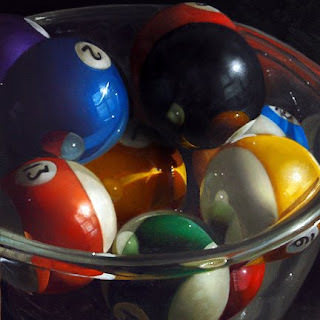 Hadn't done any pool balls in a while, and thought it would be a colorful item to finish off the current group of five paintings for ebay. If you'd like to bid on this painting you can participate in the auction by clicking here. Had some good news this week. Received an email from Spalding Nix that the five paintings I had done for Print Pack Inc. were hung in the board room late last week. Word is they were a hit. The CEO, and his mother, the wife of the man who started the business, were very impressed. Whew! I can finally breath a sigh of relief. Spalding wrote that all of the art contracted for the project was very well received. I'm looking forward to heading back over there to see everyone else's work. Jeff Cohen commission for Print Pack Inc. I wanted to make special mention of the two paintings produced by Jeff Cohen for this project, because they are truly spectacular. These were done in Jeff's "fragmented" style, where each painting is composed of multiple plywood panels. Every panel is painted separately, then mounted together onto a wooden frame to create the final piece. 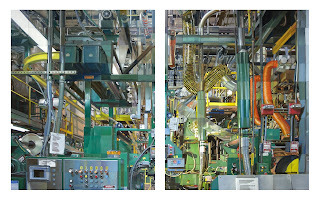 I believe each of these paintings is 48 x 60, and show the presses used to print the packaging for the items you saw in my contribution. Jeff, this is a masterpiece. Got a little more good news this week as well. The commission for the company in Chicago is still a possibility. I emailed the first few compositions to Curt Nance, who is directing the project, last week, and he was pleased with what he saw. Curt is a no-nonsense guy, and I think he can move this along smoothly. That's my gut feeling anyway. It will be interesting to see how this goes. I hope it works out. It could be a fun project, and with this economy, a source of much needed income as well.